A. 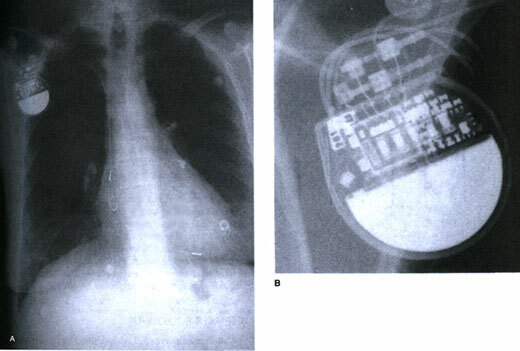 A chest x-ray of a patient with dual-chamber unipolar pacemaker. The leads are placed inthe right atrial appendage and in the right ventricular apex, respectively7. Note only one electrode at the distal tip of each lead. B. Close inspection of the pacemaker generator shows that the ventricular lead has pulled out of the header with very minimal contact between the ventricular electrodes and the metal contacts in the pacemaker header. This caused intermittent failure to sense and pace in this patient.